Mara Corday | 50 Westerns From The 50s. 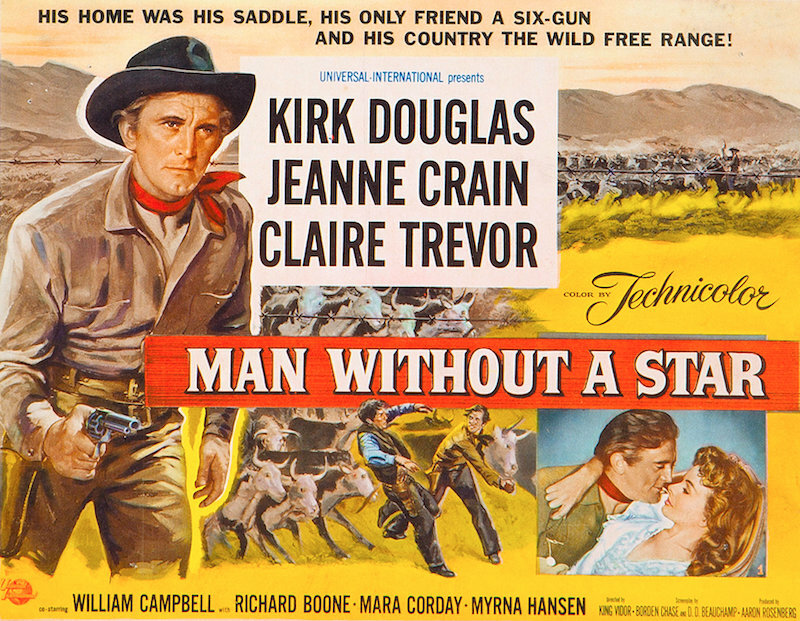 50s Westerns Blu-Ray News #277: Man Without A Star (1955). Kino Lorber has announced the upcoming Blu-Ray release of Man Without A Star (1955). That makes two U-I 50s Westerns announced within a week of each other. I’d sure like to see that trend continue. Kirk Douglas put the movie together through his new production company, and it made him a lot of money. The picture’s got a great cast — look at all those character actors! It was shot by Russell Metty in Technicolor to be cropped to 2.00 to 1, a short-lived standard at Universal (This Island Earth and The Mole People were also 2:1). Highly recommended. 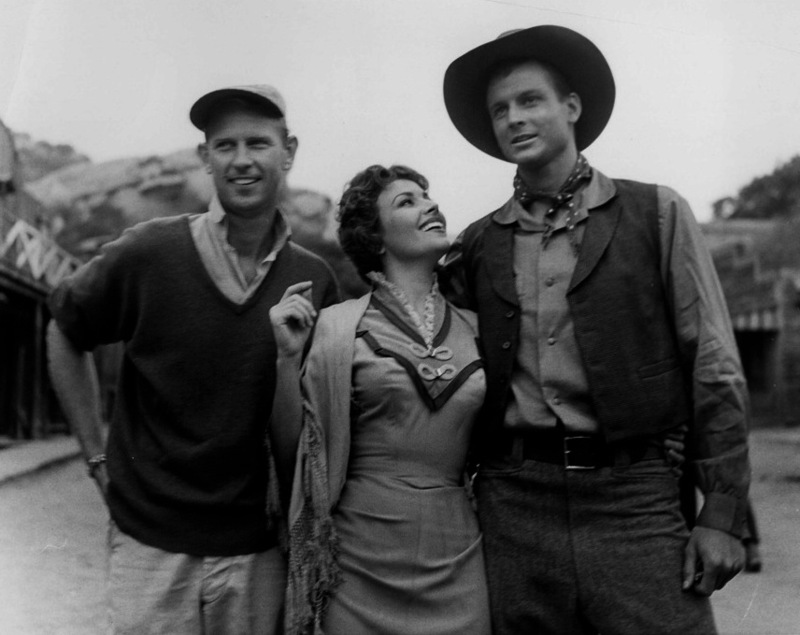 L-R: Maury Dexter, Mara Corday, Jody McCrea on the set of The Hanging Judge, which was released as Naked Gun (1956). Maury Dexter was an extremely nice man. He didn’t know me from Adam, but after an introduction from Kit Parker, he spent hours telling me all about how Lippert, Regal and AIP operated — and how he fit into the operation. 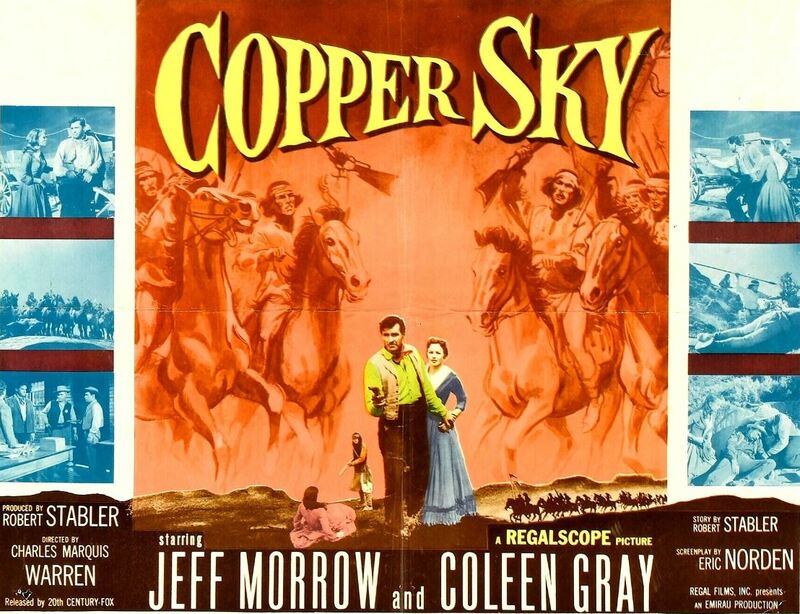 Being that I’m kinda obsessed with the Regalscope Westerns, I was in movie geek heaven. Mr. Dexter worked as an assistant director on Little House On The Prairie for much of the show’s run (when Michael Landon died, Maury decided it was time to retire), so knowing him helped me score plenty of cool points with my daughter. A friend and I helped Maury put together his memoirs. It’s a fun read, and I’m honored to have played a tiny part in getting it out there. He covers his childhood, stint in the military and Hollywood career — which includes everything from acting in a Three Stooges short to working for Lippert during the Regalscope years to directing The Mini-Skirt Mob to being a key member of Michael Landon’s production team. After we got the memoirs finished, Maury’d call me up every so often just to say hello. I’d have a question about Frontier Gun or something, and we’d end up talking movies for quite a while. And you all know how much fun that is. 50s Westerns DVD/Blu-ray News #202: Our Best Of 2015. First, thanks to everyone who sent in their picks — we had a larger turnout this year. Your responses were very thorough, and they made it clear to me what a good year this was for 50s Westerns on DVD and Blu-ray — you brought up tons of em. Here are the Top 10, ordered by the number of votes they received. This one topped the list in a big way. 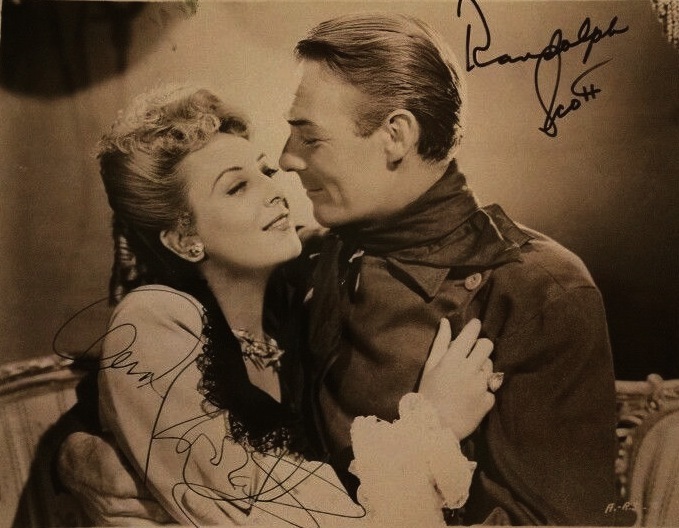 I was so stoked to see this fairly obscure Randolph Scott picture rescued from the PD purgatory where it’s been rotting for years — a lot of you seemed to feel the same. Mastered from 35mm fine-grain material, it’s stunning. The Blu-ray release from Paramount made last year’s list, and this UK release was a strong contender this time around. 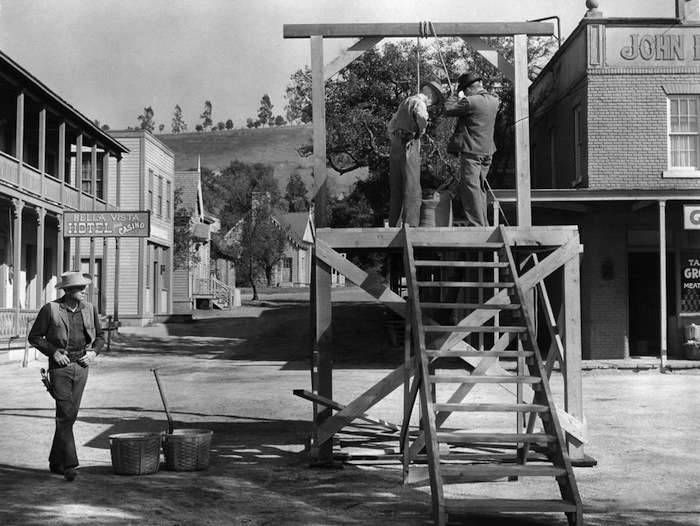 Eureka gives us the opportunity to see what Paramount’s controversial 1.66 cropping looked like. I’m pretty biased when it comes to this one, and I was happy to learn that others were as pleased with it as I was. 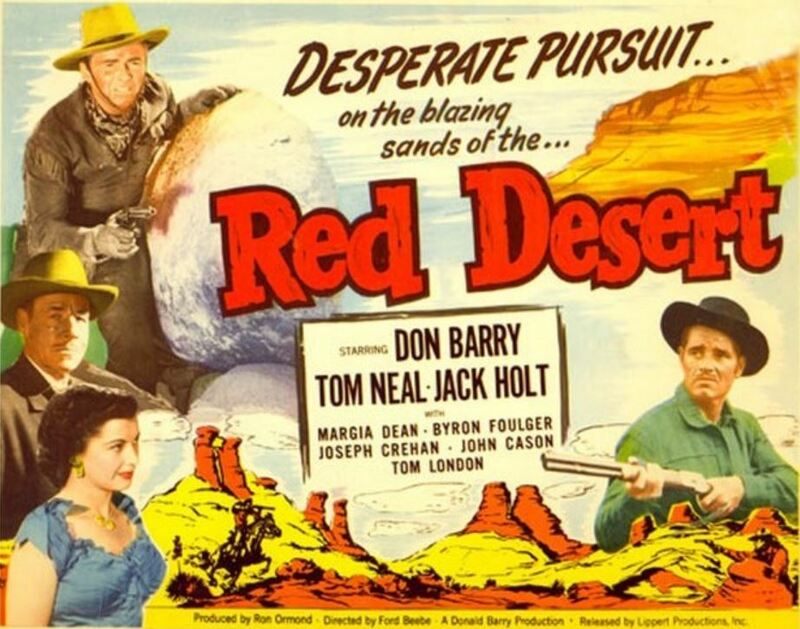 One of the greatest Western stars goes out on a high note, even if it is a low-budget one. It’s hard to believe this was a 2015 release, since it was on Olive Films’ coming-soon list for such a long time. These Regalscope movies look great in their original aspect ratio, and for my money, this is the best of the bunch. It makes me feel good to see Allan Dwan get some attention, and stellar presentations of his work, like this one, should continue to fuel his (re-)discovery. A solid Robert Mitchum Western, with the added punch of a terrific 1.85 hi-def transfer. This is a lot better movie than you probably remember it being. This really knocked me out — I’d somehow missed out on what a great movie this is. It took me a while to get used to Rod Steiger and his affected accent, but this is prime Sam Fuller. Black and white CinemaScope is a big attraction for me, so I’d been waiting for this one for years. It was worth the wait. A really cool little movie from Republic and William Witney. It was Witney’s favorite of his own pictures, and it’s pretty easy to see why he’d be partial to it. His work here is masterful. Koch out of Germany is treating us (or those of us with a Region B player) to some great Universal 50s Westerns on Blu-ray. This one was released in Universal’s 2.0 ratio of the period. Some found it a bit tight, but it’s a gorgeous presentation of a movie not enough people have seen. 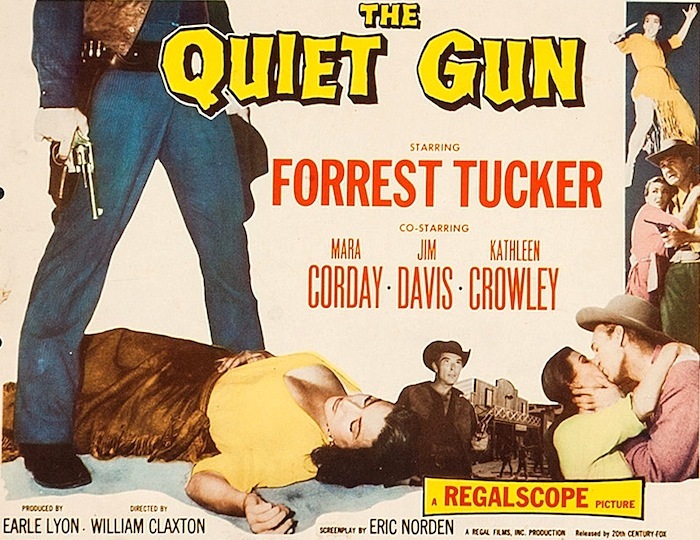 50s Westerns Blu-ray News #171: The Quiet Gun (1956) And Stranger At My Door (1956). They say good things come to those who wait. 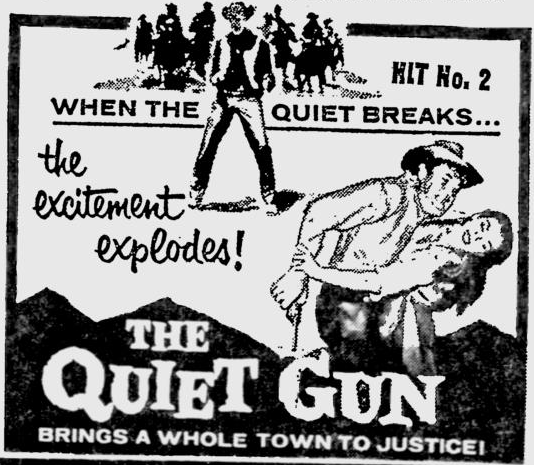 Well, The Quiet Gun (1956) is a very good movie — maybe the best of the Regalscope Westerns. And we’ve been (almost patiently) waiting quite some time since Olive Films hinted at its release. This is one many of us have been longing for in all its widescreen glory, and it’ll be a joy to toss the almost unwatchable pan-and-scan bootleg I’ve had for years. It’s coming on both DVD and Blu-ray March 31. What’s more, Republic’s Stranger At My Door (1956) from William Witney is part of the same batch of releases. It’s an excellent picture starring Macdonald Carey, Patricia Medina and Skip Homeier. Thanks to John and Laura for this wonderful news. I can’t wait. 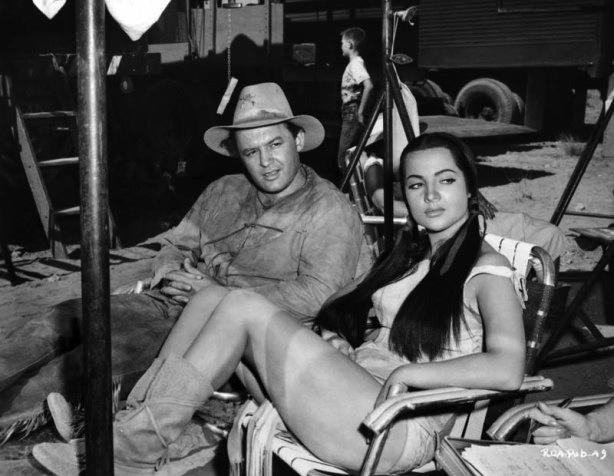 50s Westerns Discoveries Of 2014. Yesterday, I posted our favorite DVD releases of the year. Today’s list is made up of films we discovered during 2014. Titles that made the list were mentioned by at least three people. It’s a great lineup of fairly obscure, medium-budgeted 50s Westerns — and if you haven’t discovered them yourself, search them out. Ambush At Tomahawk Gap (1953) Fred F. Sears was extremely prolific, and his 50s Westerns are worth seeking out. This is one of the better ones, available through Columbia’s on-demand DVD program. Apache Drums (1951) A suspense picture dressed up in cowboy clothes, produced by Val Lewton and directed by Hugo Fregonese. With Stephen McNally, Coleen Gray, Willard Parker, Arthur Shields, James Griffith and Clarence Muse (who’s superb in a small part). Border River (1954) With George Sherman directing Joel McCrea, Yvonne De Carlo and Pedro Armendáriz, how could it not be great? Shot around Moab, Utah. 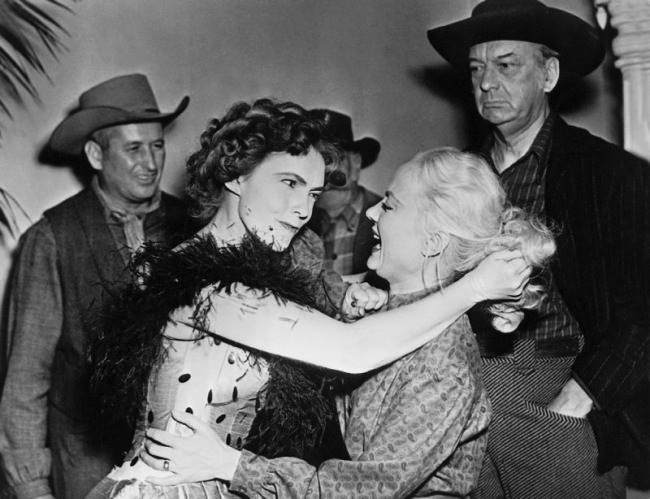 Cow Country (1953) Coming across a new Lesley Selander picture is always a treat. This one features Edmond O’Brien, Helen Wescott, Bob Lowery, Barton MacLane, Peggie Castle, James Millican and Robert Wilke. A Day Of Fury (1956) One of the most unusual, and overlooked, Westerns of the 50s. Harmon Jones directs Dale Robertson, Mara Corday and Jock Mahoney. I’m so glad this one’s being rediscovered. Four Guns To The Border (1954) Rory Calhoun, Colleen Miller and Walter Brennan in an excellent Universal Western directed by Richard Carlson. 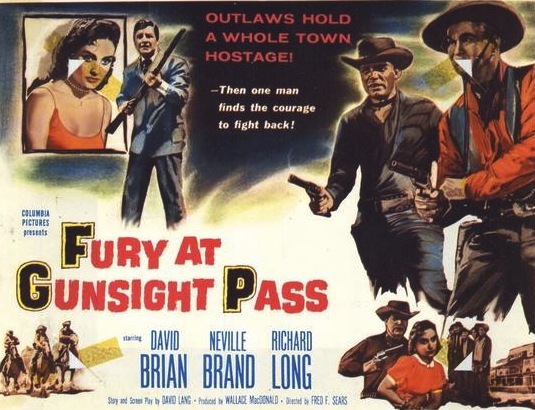 Fury At Gunsight Pass (1956) Another good one from Fred F. Sears. Wish this one would see a real DVD release — black and white widescreen is so cool. The Silver Whip (1953) Dale Robertson, Rory Calhoun, Robert Wagner, Kathleen Crowley and James Millican star in this taut, tight picture from editor-turned-director Harmon Jones. The staging of the climactic chase is masterful. Stage To Tucson (1950) Rod Cameron and Wayne Morris. Lone Pine in Technicolor. Surely that’s worth an investment of 81 minutes. 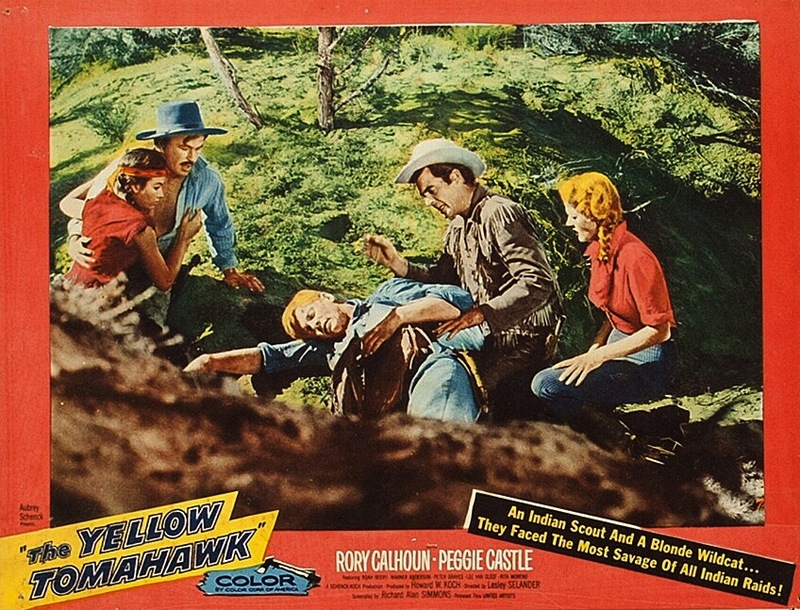 The Yellow Tomahawk (1954) Sadly, this color film is only available black and white. But it’s still a solid effort from the ever-dependable Lesley Selander — with a cast that includes Rory Calhoun, Peggie Castle, Noah Beery, Jr., Peter Graves, Lee Van Cleef and Rita Moreno. Book Review: Talk’s Cheap, Action’s Expensive – The Films Of Robert L. Lippert. A few weeks ago, I broke my glasses and began relying on an old (pre-trifocals) pair while I scrambled for an eye exam and new frames. Reading became very, very difficult. Not the best time to receive a book you’re really excited about. But that’s exactly when Mark Thomas McGee’s Talk’s Cheap, Action’s Expensive: The Films Of Robert L. Lippert, from BearManor Media, turned up in my mailbox. Lippert Pictures (and related companies) cranked out cheap little Westerns like 1952’s Outlaw Women, along with gems such as Sam Fuller’s I Shot Jesse James (1949) and The Quiet Gun (1957). (They covered the other genres, too.) I’m a big fan of these films and was determined to make my way through the book with or without spectacles, holding it so close I risked paper cuts on my nose. McGee set the book up very well. The first 80 pages or so read as a biography and history of Lippert and his career, from the theater business to film production. I had a working knowledge of the Lippert story going in, but was always coming upon something I didn’t know. There’s a filmography, arranged by company, that makes up the bulk of the book. And finally, there’s a listing of the Lippert theaters (the closest to me was in Chattanooga, TN). If there’s a downside to this book, it’s that the filmography points out film after film that you’d love to track down and see. You’ll find a lot of them available from Kit Parker Films and VCI, and others scattered here and there. Some of the Fullers were even given the Criterion treatment. As for the rest, well, happy hunting. It’s very easy to recommend Mark Thomas McGee’s Talk’s Cheap, Action’s Expensive: The Films Of Robert L. Lippert. Now that my new glasses are in, I’m reading it a second time. 50s Westerns DVD News #139: Olive Releases For 2014. Olive Films have announced a few titles they’ll have to us in 2014. There are three 50s Westerns in there, and they’re good ones. Dwan directs a sort-of spoof for Repubic. Good stuff. This film should be much better known than it is. The scene with the horse (if you’ve seen it, you’ll know what I mean) is Witney at his best. Maybe the best Regalscope Western. I’m dying for this one!